July new homes sales rose 5.4 percent from June and 25.8 percent from July 2014, joining other improving housing market indicators. The increase brings annual new home sales to 507,000, or just over half way back to a normal year. New home sales are greatly dependent on existing home sales since three-quarters or more of new homes are purchased by existing home owners. In turn, existing home owners are becoming more willing and able to sell their homes as equity positions improve and the employment market grows and provides more security that employment will continue. Median new home prices increased 2 percent from July 2014 and average prices increased 4.8 percent. Actual sale prices have increased because the composition of homes sold has shifted away from starter or first time buyer homes and towards move-up buyers. At the same time, builders are facing higher costs for labor and lots. That trend will continue as the home building industry continues to expand and must pay higher prices for the resources needed. Material costs have remained calm as the world economy slows and demand from other markets have cooled. New home inventories increased in July to 218,000, the highest level in more than five years (March 2010). The continued expansion of new homes for sale is another confirming sign that builders expect the sales market to continue it improvement just as they expressed in the NAHB/Wells Fargo Housing Market Index. 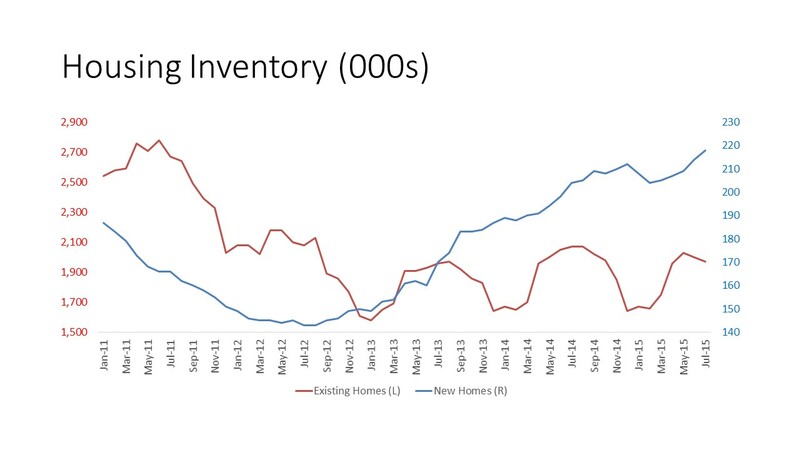 Inventories of existing homes however have not improved significantly for several years. More existing homes on the market will help feed the first time home buyer delayed demand as well as free up current home owners to buy a new home. ‹ Are AD&C Lending Conditions Tightening?